Is anyone blogging about this? I haven't come across anything about this, but I'm not the biggest reader of blogs originating on the Upper West Side. Background: Many young, single Modern Orthodox Jews live in the Westmont and the Key West, in addition to the Paris and the James Tower. In most, if not all, cases, one bedroom apartments are occupied by two people and two bedroom apartments are occupied by four people. This is accomplished by hiring people to build temporary walls that turn small dining areas and half of the living room into two separate bedrooms. (This photo shows what looks like a 2-bedroom apartment without walls. In the converted apartment that I lived in, the two windows would have been windows to two new bedrooms.) Even in other buildings, almost everyone I know, including myself, has at least one fake wall or has turned a closet-less dining room in an old, pre-war apartment into a bedroom. As far as I know, if you have moved to New York any time within the past three years or so, this is the only way to find a place to live with your own bedroom between W 70th St. and W 100th St. for $1200/month or less. There are some very small bedrooms available in these Westmont/KeyWest apartments that are less money, but I couldn't live in a small space that had room for a twin bed and a dresser and nothing else. Other people get lucky and find rent-stabilized apartments with lower rents or where you get more for your money. Also, if you happen upon an apartment that has been passed down from person to person for awhile, with at least one previous tenant always staying on, you can get a very good deal, maybe even around $900/month, especially if you know Elba. (You have to know her and you have to bribe her, though, and there's still no guarantee something will be available. And if something in one of her buildings breaks, tough luck.) 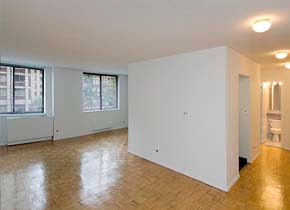 More information about typical Upper West Side rents here. Anyway, so this is how people live. But that opulent lifestyle is now threatened by rising rents. It's not just the Westmont and the Key West. I have a friend who lives in a door-man-less walk-up on 100th, between Columbus Ave. and Central Park West (not the fanciest part of the Upper West Side by any stretch of the imagination), and her rent is being increased by 10% this year. Maybe that's "typical" (is it? ), but if your rent is starting out at $1200/month for a studio, having it go up to $1320/month is not easy. In my building, which is not billed as a luxury building, new leases are being sent out with increases from 46% to 76%! Some people managed to "bargain" the management down to a 20-30% rent increase, but it's still crazy. We have a part-time doorman (8 am to 11 pm, roughly), laundry in the basement, and elevators, but that's the extent of the luxuriousness of my building. It was originally built in the 1910's and it has not been well-maintained. The plumbing is terrible, both in terms of wacky water pressure and in terms of sudden, surprising switches from temperate water to very hot or very cold water. It makes for unpleasant showers, but, well, we put up with it. Certain times of day are better than others. (The management said that they couldn't fix it without ripping out the entire building's plumbing and starting over from scratch.) There are also serious structural problems with the building. A few people have literally had their kitchen ceilings fall down, and it's not uncommon to see tiles buckling in the bathroom or large water leaks in the walls that the super comes and paints over every once in awhile. The lobby smells strongly of gas or heating oil when it's cold outside, and the doorman told me that it's been that way for the past 28 years and it's because they use No. 6 oil. Nothing can be done, he says with a shrug. How can you possibly charge $4000/month or more for a two bedroom apartment in such circumstances? Entire floors of these buildings are, of course, moving out. The Westmont and Key West are, apparently, having enough trouble filling these newly-vacated, $4900/month two bedroom apartments that they're offering $500 to current residents if they find tenants. The floor below me in my building has emptied out, too. I'm not sure what will happen. I'm hoping that nobody will be willing to pay these higher rents and that the rents come back down to the "reasonable" range. I always thought the big reason people get sticker shock coming from the NYUWS to DC is that nobody in DC does the whole "fake wall" thing. I don't know about the assorted legalities (IANAL, B"H), but I would assume that there are probably safety regulations against building the fake walls - in DC, a room must have two different egresses and a closet (and be of a certain minimum size) to be called a "bedroom." I wouldn't be surprised if building fake walls was illegal, but I'm pretty sure you don't need to have a closet and two egresses to call a room a "bedroom" in New York. In older buildings, the bedrooms don't have built-in closets at all, I think (like in Israel--people use armoirs). I did hear, though, that the Westmont and Key West were having trouble finding new tenants at the raised rate, so are relaxing their lease rules about fake walls (lots of leases say that fake walls are illegal, but everyone ignores them). As far as fires go, well, our apartment doesn't have a fire escape at all. There is only one way out--the front door--and then there is one stairway down (plus an elevator, not to be used in event of a fire). I don't know if it's legal, but I can't imagine they would have been able to build the apartments the way they did if it wasn't. My apartment has no fake walls and two bedrooms with closets and is under $1200/person, but the bedrooms are very small. But I'm ready to be done with the Upper West Side, as long as everyone I know agrees. What neighborhood should we all move to? Thanks for blogging about this. My tale of woe is similar. I also live in a non-luxury (though enormous) pre-war apartment in the high West 90s. The elevator bounces dangerously whenever it comes to a stop, there are garbage bags in the halls because our landlord refuses to allow garbage cans, laundry costs $2 a load, and (interestingly) we also have those horrible water temperature shifts (people have been burned more than once). Despite all this, the landlord increased our rent this past summer by 15%. 15%!?!?! There was no negotiating with him. He told us we were "lucky" to pay that much for our apartment and if we didn't want it at the new price there were plenty of people who did. This seems to be true, alas, since new people keep moving in all the time. (I do think that they are lawyer/finance/etc. types). A second step would be to push your shul, school, or union to join Manhattan Together (see http://www.stbarts.org/blog-post.asp?ID=43). Manhattan Together is what is sometimes known as a "power organization" that organizes churches, synagogues, mosques, schools, unions, and sometimes other nonprofits to work together for serious and systemic change in NYC. (Their sister organization, East Brooklyn Communities, was the group that built the famous Nehemiah (affordable) housing in burnt-out Brooklyn. Other related organizations were the ones who ran the first successful living wage campaigns in the US.) Right now Manhattan Together is working on affordable housing, public education reform, and immigration. Check it out. Above all, I think it's important that, as your post did, we share what's going on with our personal situations. Knowledge is (or can sometimes be) power. Looks like Charles E Smith isn't thinking ahead. If all the Modern Orthodox singles are priced out of the Key West and the Westmont, then how will they meet, get married, moved to the DC suburbs, have kids, and send them to his day school? How about you all stop throwing your money away and move elsewhere? If you look at rents just about anywhere other than the UWS, you'll see just how much you're overpaying even before the huge rent increases. I recently saw an ad for a 1000 sq. ft 2 bdrm apt at 184th and Broadway (right near the A train, 25 min. ride to 34th St.) for $1050/month. Now, there must be something seriously wrong with that apt given the price, but you can definitely find spacious (700 sq ft) 1 bdrms in Washington Heights for $1000/month. Or how about Brooklyn? I can't imagine paying $1200/month to be caged up in a tiny fake bedroom. For $900/month, I have my own 475 sq ft apt in an elevator building, 3 large closets, and the most heavenly shower ever. Ok, ok, you want to live in an area where there's something going on at night. Maybe try the 110th St. area. You can have your own bedroom there for $850/month. Seriously, nobody should spend over $1000 to share a crowded apt. When will the madness end? Thanks for a view of what could have been. I considered moving the UWS when I was single but was intimidated by the rents and for what little you got for that amount. I probably would have been eaten alive by NYC but probably would have enjoyed the scene for a little bit. I also live in a non-luxury (though enormous) pre-war apartment in the high West 90s. My apartment is some what of a disaster. It is about 1 safety regulation away for it being taken down and made into something people can live in. what can we do. Maybe this blog will help us all get together and do something about it. Perhaps we can sue the landlord?